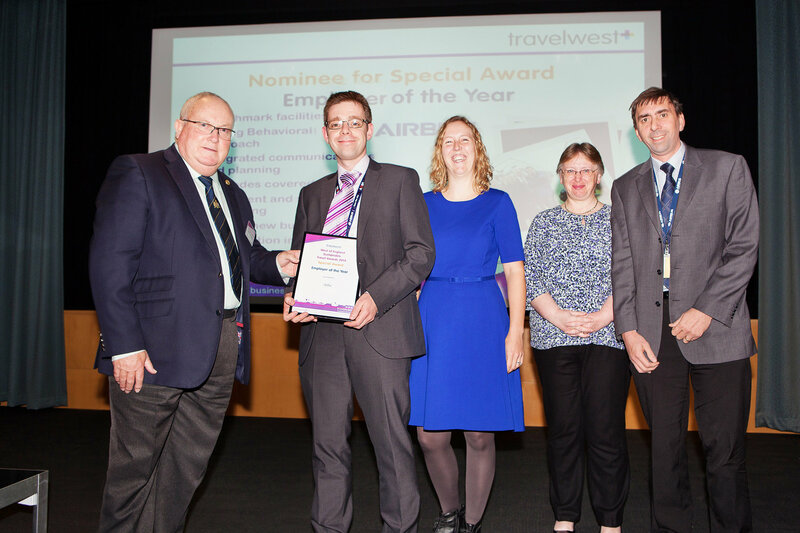 Over 100 representatives of organisations from across the West of England attended the annual Travelwest Sustainable Travel Awards on 20 November at Hewlett Packard in South Gloucestershire. Several businesses based in South Gloucestershire were nominated for awards, with winners including Nvidia and Airbus, who were recognised for their initiatives to help employees develop alternative ways to travel to and from work rather than making solo car journeys. Airbus in Filton picked up the ‘employer of the year award’, following their impressive efforts to encourage cycling and active commuting to their new Filton site. They have recently self-funded a new facility for cyclists, providing 700 new undercover parking spaces for bikes adjacent to a cycle hub which provides 40 showers with drying, changing and storage facilities. Annual commuter surveying shows a six per cent reduction in solo car trips to the site since 2013. Aztec West based visual computing company NVIDIA won the award for ‘best motivational campaign’, due to their innovative promotion of the Big Commuting Challenge 2014. This summer, the inter-business competition saw more than 3,600 people from across the West of England swap their usual car journeys in favour of more sustainable options such as walking, cycling, using public transport or car sharing with others. Challenging Sustrans, the developers of the Challenge website to a head-to-head competition, NVIDIA achieved the highest participation rate within the ‘91 to 249 employee’ category. Katherine Passmore, of Sodexo (working for Atkins, Aztec West), won the award for ‘individual most committed to sustainable travel’. She was described as a passionate, dedicated employee who regularly goes that extra mile to encourage her colleagues to travel more sustainably. Katherine works closely with North Bristol SusCom and in particular has been involved with the development and promotion of The Kings Ferry Business Shuttle. South Gloucestershire Council’s PTSE Chair Councillor Brian Allinson was in attendance to present the awards and hand out Travel Plan Accreditations certificates. He said: “It’s great to see so many inspirational local organisations making sustainable travel a part of the way they do business and an honour to present awards to all of the worthy winners. The event’s keynote speaker was Ben Hamilton-Baillie, urban design expert and shared space advocate, who gave a unique insight into the development of shared space principles for street design to improve safety, congestion and access. The West of England authorities are currently delivering a package of support for businesses to help more commuters choose sustainable travel options under the Local Sustainable Transport Fund.